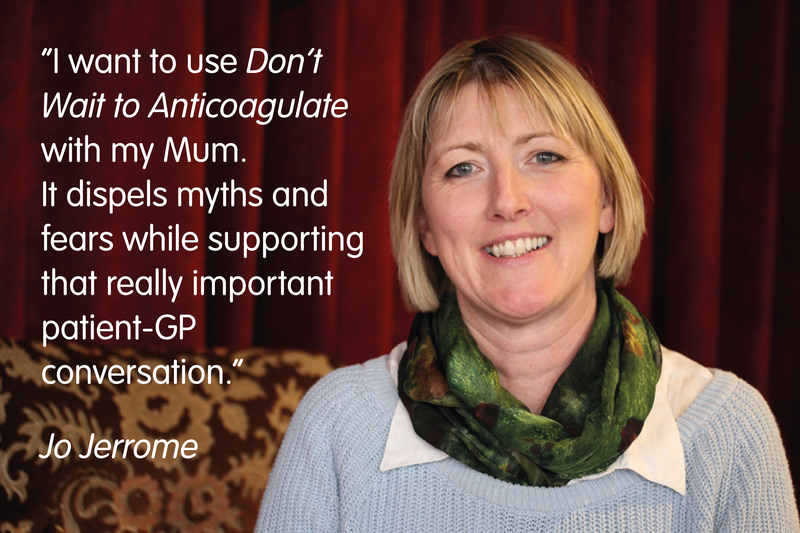 Jo Jerrome is a public contributor on the steering group of our Don’t Wait to Anticoagulate project, which aims to improve the management of stroke risk for people with atrial fibrillation (AF). Here she explains why she is so proud to be part of the initiative. It has been enlightening to be part of the Don’t Wait to Anticoagulate project. I truly believe it is an exemplar model in integrated patient decision-making tools. I’m really keen for it to get picked up more widely as there is so much we can learn and implement from the project to benefit AF services in other parts of the country. For me, what makes the project special is that from the start patients and clinicians have been involved equally – identifying the challenges, listing the needs and constantly reviewing and feeding back into the draft versions. The result is uplifting – I want to use it with my Mum. It dispels myths and fears, from aspirin to bleeding, while supporting that really important patient-GP conversation. Until recently, I was the deputy CEO for the Atrial Fibrillation Association, a national patient charity. When I started the only anticoagulant available was warfarin and there was an awful lack of information and shared knowledge about the condition. What was coming through was the prevalence of AF amongst the population and the risk factors that previously had not been recognised. Very quickly on the back of that was evidence on the ineffectiveness of aspirin. At the charity we were looking at how to make information available and accessible to patients, their families and people working with them. But the big challenge we could see was that it’s one thing having all this knowledge but what do you do with it? I sat on five or six NICE committees and was involved in scoping NICE guidelines and in 2014 I sat on the committee to develop the NICE stroke prevention in AF patient decision-making aid. There was a wealth of guidance then about AF pointing to what we should be doing and yet take that on a year and AF management still isn’t great. Over 40% of patients who should be anticoagulating aren’t, and there remains a real lack of confidence in knowing what the best anticoagulant is. People still ask why they can’t use aspirin – isn’t it safer? There are still myths that needed busting. Due to my parents’ health, I stepped down from the AF Association 18 months ago. At that time I’d be liaising with the West of England AHSN on the initiation of Don’t Wait to Anticoagulate and right from the start I’d been really excited by it because it was everything could see we needed, as well as being back up by NICE guidance. So when I stepped down, I contacted the West of England AHSN to register as a public contributor because I wanted to remain involved, and they invited me to be on the project steering group. NICE had created a great deal of excellent guidance but it wasn’t particularly accessible. Their patient decision-making aid was only online and about 33 pages long. It had everything you needed in it but it wasn’t user-friendly: it needed translating. So what excited me was that the West of England AHSN saw this; they saw the need clinically; they saw the need economically across healthcare and social services; but they also saw the patient need. And they wanted to make it accessible right at that point of partnership between the GP and the patient, because that’s when most of those conversations about AF management happen. What’s most innovative about Don’t Wait to Anticoagulate is this toolkit they’ve developed to support that conversation that’s also accessible when the patient has left the surgery and wants to go back and read more, either online or in print. As a carer myself, I’ve attended appointments with my parents and you hear all these figures but what you actually want to know is, what does this mean to me? Don’t Wait to Anticoagulate helps to interpret this using pictures and comparisons. For instance, if I were on a bus, how many people on that bus would be affected? It’s real life. You can put that into your life and make an informed choice. The shared conversation is the key to this project that will change things. It’s building on what was already there. It hasn’t tried to duplicate things. It’s built on solid foundations and has identified where the need is. This tool helps the patient and the general practitioner implement the NICE guidelines by having that conversation around the personal risk, your options on reducing risk, why some therapies might not be as beneficial as we once thought, and why others are really better at safeguarding you from a catastrophic stroke. All the important stakeholders have been involved, working with clinicians, specialists and also general practitioners because they’re the ones who are going to be using it. And to my knowledge well over 20 patients have been involved in reviewing and sharing ideas. They really had all those key stakeholders at the heart. And out of all of them, patients outnumbered them all. The team has been amazing in how they’ve constantly been reviewing and looking at ways to improve. This is always based on what the users have fed back, as well as what the steering group has commented on. The project is so refreshing. It’s taking really good clinical evidence and guidelines into real life practice and saying, how do you make it work? That’s why I think it’s innovative; it’s about sustainability; and it’s got all the voices needed represented in it. And at every phase it’s willing to amend and it does it quickly. Change can take a long time in healthcare. This project proves that’s not necessary. This project is driven by outcomes to improve the service and for the patient, and that is critical. I feel very privileged to be part of the project. It really is utilising all the learning available on AF to move it forward. We needed something like an algorithm from the NICE guidelines; something to simplify and interpret. And the West of England AHSN has done it with Don’t Wait to Anticoagulate and they’ve done it really well. Visit the Don’t Wait to Anticoagulate website here.